Hey girls! How nice is it to see the sun out! It's making me so excited for summer and my holiday and pub gardens and such lovely fun things. It's also making me want to go shopping for pretty summer dresses.. Although it will probably snow or thunderstorm tomorrow! It's my best friends birthday tomorrow so we went on a night out last night with the giirrrls and I had such a fun night. If you read my recent haul post you will have seen this playsuit which I absolutely fell in love with and here it is in action. I wore studded black flats as my knees do not do heels well anymore, booo. I'm just glad I don't need the height, as you can see i'm the same height as my small little friends with their heels on hehehe. 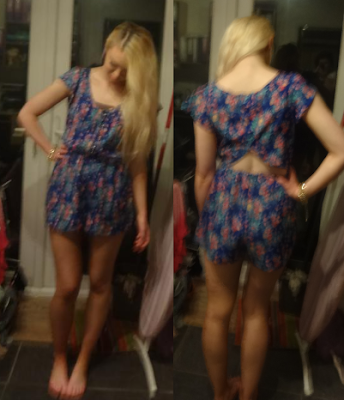 The playsuit was a bargainous £10 from Primark and my shoes are also Primark, I think they're 6 or 8 pounds. I'm now realising how much Primark I wore as all my jewellery was also from there.. However I did take a coral clutch bag from New Look. I won't list every product on my face but I'm wearing Estee Lauder double-wear foundation, Bobbi Brown gel liner and Mac lipstick in 'Impassioned' which I love love love so much. This is only the second time i've worn it but it is just my perfect colour and I wish I could wear it all the time! i love the lipstick you're wearing!